(CNN) -- She "dreamed a dream" on the TV show Britain's Got Talent, but could Susan Boyle be living that dream as the star of a West End show? 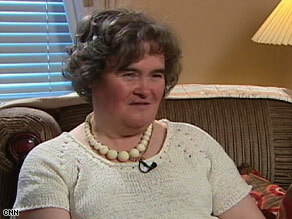 Susan Boyle says despite snickers when she began singing, she knew she just had to win over those cynics. It's a possibility, according to a spokeswoman for Andrew Lloyd Webber, the award-winning composer and producer of more than a dozen musicals including The Phantom of the Opera and Cats. Lloyd Webber recently bumped into Simon Cowell, the music and TV producer behind Britain's Got Talent and American Idol, and "discussions took place" about future possibilities for Boyle, said the spokeswoman. "He's an admirer of her talent," she said. "There's certainly been no firm offer made (but) discussions about Susan have been had." Boyle became an instant sensation when she appeared on the British talent show last month. Do you think she could be a stage star? The 47-year old from West Lothian in Scotland, who revealed she had never been kissed, surprised the audience and judges when she belted out the classic "I Dreamed a Dream" from the musical Les Miserables. The performance was a hit on YouTube and made her famous around the world. The Sun newspaper in Britain reported Friday that Webber offered Boyle a role in London's West End, but the spokeswoman said that is inaccurate and that no offer has been made. "She's a great fan of my shows," Lloyd Webber was quoted as saying to The Sun. "If she wanted to be in one, well, it could happen. It would have to be the right role. Maybe I know what it could be, but I'm not telling. She's got a great future."